Be prepared to be completely charmed by The Music Man, playing through Jan. 29 at The Carnegie – and to be swept up by the singing and to be crazy about the supporting cast, along with leads Dave Wilson as con man Harold Hill and Sarah Viola as Marian the Librarian, the woman who catches him by surprise. How can you not love The Music Man, which isn’t just about a romance but about the stiff-necked citizens of River City, Iowa early in the 20th century, who are brought to life by the excitement and adventure of a boys band – and about one particular kid who is lifted from sadness by the idea of a cornet? The whole thing plays out to one of the most sparkling scores in musical theater – most of the songs are so ingrained in the national consciousness that you can sing along. I’m throwing lots of bouquets and I’ll start at the top. It’s a good time to mention again that I follow directors, so how happy was I when I opened the program and saw Greg Procaccino's name? Procaccino is one of a handful of directors on the smaller theater circuit who always deliver. He makes the small stuff works as well as the big stuff – you won’t see one chorus member who isn’t engaged in the action and Procaccino makes good use of the auditorium as well as the stage, and he adds subtle shadings that point to a well-considered approach to the show. Double my delight, because Steve Goers is musical director, another major talent. The chorus numbers are terrific, and the gentlemen of the barbershop quartet – Michael Bell, Zac Coleman, Mike Connelly and Paul Gilman are so good you can’t believe they haven’t been singing together for years (They all have an association with the Southern Gateway Chorus, find out when the next concert is). One of the good things about first-rate directors/musical directors is they attract top performers. Sarah Viola is a perfect Marian, starry-eyed and romantic beneath her frosty exterior, and captivating, too, with her glorious voice. I’d have liked it if Wilson were a little more of a rascal, but he gives a spirited, well-sung performance and he’s a solid partner for Viola (which is good, because they’re married). The key trio of supporting players are well-known for their comic gifts: Sean Mette all but levitates off the stage as Harold’s old pal Marcellus, and you won’t stop grinning when he’s center stage. Jim Stump is officious Mayor Shinn and Torie Pate is his small town diva wife and they’re both a pleasure to watch. Anthony Coletta plays Marian’s little brother Winthrop and draws “awwwws” from the audience, which means he’s made an emotional connection, just as he should. And I can’t leave out the Pick-a-Little ladies – Burgess Byrd, Lauren Carr, Sara Kenney, and Lori Valentine, who are a hoot. The one off-note in the show: at the performance I attended, the sound didn’t support individual players over the orchestra; the ladies were victims most often. Compliments, too, to the lively work of choreographer Maggie Perrino – even the younger kids never have a foot out of place - and local artist Bill Ross who has created a simple but effective environment. The Music Man, through Jan. 29. The Carnegie, 1028 Scott Blvd., Covington. 7:30 p.m. Thursday and Friday, 2 ad 7:30 p.m. Saturday and 3 p.m. Sunday. Tickets $30, $23 students, $18 children. (859) 957-1940 and www.thecarnegie.com. Everybody knows Harold Hill and Marian the Librarian, the sweethearts at the heart of The Music Man, now getting a don’t-miss revival at The Carnegie through Jan. 29. But it’s the citizens of River City, Iowa who breathe life into the town. 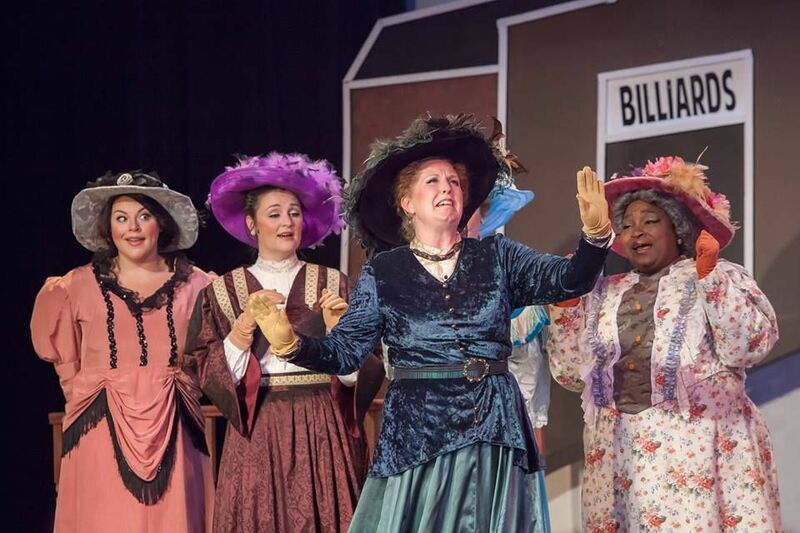 Meet Torie Pate, a veteran area actor with a formidable list of credits who shows off her finely tuned sense of the ridiculous as Eulalie Mackecknie Shinn, wife of the mayor and avid impresario and star of small town performing arts. After Pate’s first real audition (in sixth grade) when she wasn’t cast as one of the Von Trapp children in a high school production of The Sound Of Music, she has never looked back. After that early rejection, “I didn’t get discouraged. I loved being on stage performing and making people smile. So I just kept auditioning for school plays, and the summer musicals the college in my town produced. “I got in the chorus of a few shows, a featured part here and there, and finally in the eughth grade I got my first big role: the Tin Man in The Wizard of Oz. That role, more than any other I think, taught me how to create and stay in character for an entire performance. “I performed all through high school and although I always wanted to be the ingenue, I was always cast as the quirky sidekick, or the old lady. “That’s somewhat discouraging to a teenager when you just want to be pretty on stage, but now I’m glad the directors I realized my comedic ability. It gave me a lot more confidence later on when I realized there are fewer people competing for those supporting roles. Some of my most rewarding roles over the years have been those small comedic characters. “When it came time to decide on college and what I was going to do with the rest of my life, I chickened out and chose not to major in theatre. I didn’t think a girl from a small town in Ohio could make a career of acting. “So I decided to major in psychology, but I chose a school, the University of Dayton, that had an open music and theatre program so I could still perform on the side. “It didn’t take long for me to realize that acting was where my heart was, and long story short, I switched majors and became a theatre major. I was very fortunate in college to be able to perform often, both on the main stage and in student productions, and also got the opportunity to perform professionally from time to time. “By the time I graduated, I knew I wanted to head to Cincinnati. I had contacts in the theatre community here, and my boyfriend/future husband (Dave) also happened to be in Cincinnati. “I auditioned as much as I could and did temp work to pay the bills. Along the way I met some truly wonderful people in the theatre community who have become life-long friends. “When my husband and I decided to start a family, I knew I wanted to stay home with my kids (Jake and Maddie). I am much more picky about the shows I audition for now, and though I work fairly steadily, I don’t perform as much as I used to. “My husband is incredibly supportive of my acting career which makes it very easy to balance work and home. Not to say we haven’t had our share of challenges -- I’ve had to bring my kids to rehearsals because I haven’t been able to find a babysitter, but thankfully, the theatre community is very understanding. “There are days, though, especially during tech, when I only get to see my family for a few minutes, and there have been plenty of “why are you leaving us” tears over the years. But at the end of the day, I wouldn’t trade this life for anything! “Once Jake and Maddie were in school all day, I decided I needed something to do during the day besides housework and binge-watching Netflix. “I never saw myself as an educator, per-se, but I realized during my interview that this was the perfect fit for me. I get to share my love of the theatre with a whole new generation of children who, at the very least, will grow up to appreciate and patronize the arts, and if we are very lucky, some of these children will choose the arts as their path in life. “When I was asked to play Eulalie Shinn I knew I had to say yes. I’ve always wanted to play Eulalie ever since the first time I saw The Music Man. She is such a wonderful character, and so much fun to portray!